An old recipe that needed a facelift! The recipe didn’t change though, don’t worry. I found that I didn't have any complaints in serving this with veggies for dipping and I have some picky palates around me! I heated mine up in my 'little dipper' crock pot, but a regular sized crock pot would work just as well. You'll just want to start keeping more of an eye on it between 2-4 hours of being in there, stirring on occasion to keep it from burning at all. I had some serious thoughts of swapping the fat free sour cream for some fat free plain greek yogurt... but something about putting greek yogurt in the crock pot makes me a little nervous. I didn't want it to start separating and getting weird on me. 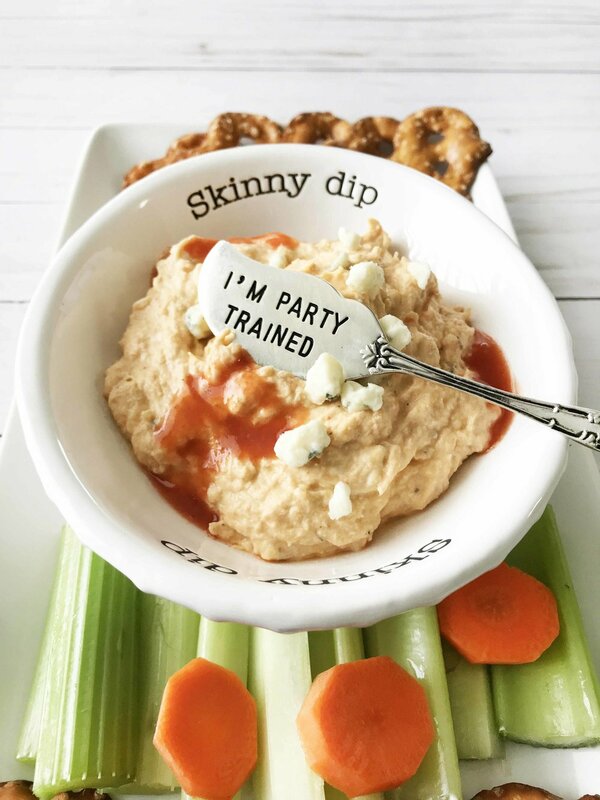 This is definitely a perfect game day or party friendly dip that is sure to please the masses. I used my homemade Dry Ranch Seasoning (which is super easy to make and great to have on hand,) but any 'ranch seasoning' will work just as well. Just be sure to adjust the nutritional values accordingly! A lightened up version of a staple that you'll find on almost any good gameday spread. Buffalo sauce cooked with chicken, seasonings, and blue cheese! Crock Pot: Place the mixture into the crock pot and cook on low for 2-4 hours. I used my 'little dipper' crock pot. Serve once hot and melted! Oven: Preheat the oven to 350 degrees F.
Lightly speak a small baking dish with non-stick cooking spray and transfer the mixture into it. Bake for about 30 minutes or until hot and melty. Remove from the oven and serve right away! Stove Top: Put the mixture in a large pot and heat over medium-low heat for about 10-15 minutes. Stir occasionally. Remove from the heat once hot and melty. Serve immediately. I served mine with fresh veggies, pretzel crisps, and a few 'sea salt' waffle chips. Yum!